Bert Beaumont, a basketball coach from Barnsley, has won the BBC Get Inspired Unsung Hero Award for Yorkshire. Beaumont has been coaching the sport for 48 years after playing basketball at college. He told BBC Look North: "I think school-age children have an entitlement to sport, music, drama or whatever interests them and I don't think they get that delivered. "I do my bit to try to change that." 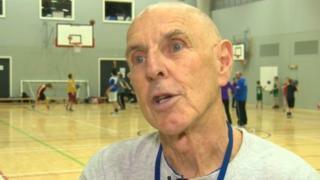 The 72-year-old, who coaches two nights a week and at weekends, says he has no interest in cutting back his commitments with the Darfield Dunkers. "As long as my health is good I will keep going because I want to do it. I look forward and think, how many more teams can I run?"